The Santa Maria del Mar is a great tip for your trip to Barcelona. The church is one of Barcelona's landmarks, which looks like a fortress with its monumental towers in the old town. Locals call the church "Church of the poor". Especially worth seeing is the interior of the Santa Maria del Mar. You can also book a guided tour and enjoy the view over old town of Barcelona from the roof. Select the product "Guided tour Santa Maria del Mar"
The construction is unique and was groundbreaking for the time. The church was built within 55 years only by Berenguer de Montagut in the 14th century and was consecrated in 1384. Due to the short construction period the Santa Maria del Mar has a very uniform-looking architecture. There's no mixture of architectural styles due to long construction times. During the guided tour in English, you will learn about the construction and the history of Santa Maria del Mar. The guide will take you to the towers and terraces with a fantastic view of Barcelona. 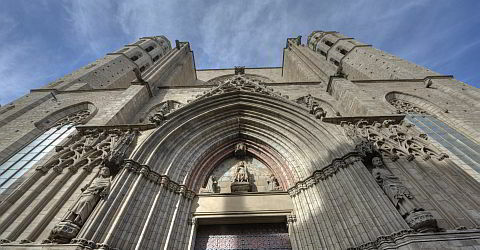 A fun and educational tour awaits you through the for the locals most popular church of Barcelona. The construction site of Santa Maria del Mar has been of particular importance since the early Christian era. Here the apostle James is said to have preached. Therefore, a small chapel was built here. In 304, the body of St. Eulalia was buried there. The bones were hidden in the 8th century before the Moors and only 15 years later found again. In 1339 these were then transferred to the cathedral. The beginning of the construction of today's Gothic church Santa Maria del Mar was in 1329 with the laying of the foundation stone. The church was the only Gothic church that was actually completed within one era. In 1714, during the Spanish War of Succession, the church was partially destroyed. The damage was repaired only provisionally. During the Spanish Civil War in 1936, these parts burned down in a fire. Due to the fire, the interior was largely destroyed as well. Also, a large part of the church windows had to be reconstructed. In 1990, the renovation and restoration work was completed. Enter the church through the portal. A narrow nave, which emphasizes the height and length of the basilica opens up to you. The stained-glass windows flood the room with subdued colored light. Due to the special construction of the nave the Santa Maria del Mar only has four narrow, octagonal pairs of columns to support the loads of 13 metres wide vault. Around the church small chapels are located that form a kind of cloister. The apse is surrounded by a delicate pillar wreath, which merges into a multi-unit vault and thus forms the conclusion upwards. High pillars divide the facade into three sections that correspond to the ships. The narrow octagonal, 33 metres high towers have a straight end on the top. Turning left around the church, you get to a small square at Carrer Santa Maria, where a granite slab commemorates the Spanish invasion of 1714. Please enter the date here and the number of people you wish to book for. Other Languages: Possible as private tour. The guided tour in English lasts about 55 minutes and includes a visit to the towers, the crypt and the roof. Without guide, the roof can not be visited.